Governor Mike Dunleavy’s budget proposal would cut more than one and a half billion dollars from state spending in one fiscal year. The Governor’s plan would also remove municipal taxing authority over oil infrastructure, redirecting millions of dollars currently in local government control to state authority. Will the Governor’s budget put Alaska on firm fiscal ground or drive the state deeper into recession? We’ll ask on the next talk of Alaska. 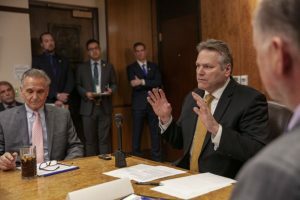 FROM THE ARCHIVES: Governor Dunleavy, then candidate Dunleavy, was on Talk of Alaska last September and responded to the question of whether he had a number in mind for what an adequate state budget would be and where he would seek to do more cutting. LIVE Broadcast: Tuesday, February 26, 2019 at 10:00 a.m. on APRN stations statewide.